Opening Reception: Tuesday, January 6, 6–8 p.m. 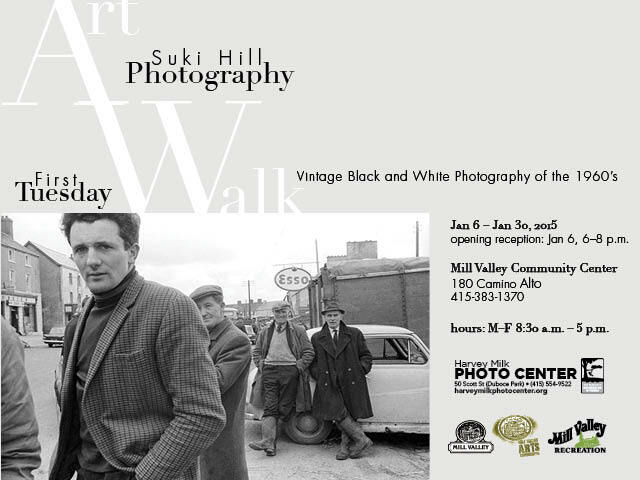 Viewing hours: M–F, 8:30 a.m. – 5 p.m.
Suki Hill was a professional photographer who lived in the town of Mill Valley, California for forty-six years. Suki photographed subjects ranging from the streets of Paris to portraits of rock stars, authors, painters, musicians and the rich and famous, but her favorite subjects the people of her community – their celebrations, events, gatherings, work – in short, their lives. Suki Hill’s black and white photography captured both individuality and relationships, and communicated a known longing for the familiar. Suki lived life with rare skill and deep heartfeltness. She practiced her art with those same gifts, and bridged the gap between the two with an extraordinary passion and sense of connection. Her photographic imagery reflected the love she felt for people, her community and the world. She knew how to bring life into art and art into life. And most importantly, she opened doors to our connectivity and our joy doing our work. Suki’s work on display here at the Mill Valley Community Center captures a time of travel and exploring for Suki. These are images and experiences that she lived in the mid 60’s as a young photographer finding her niche. And that she did. She had a magnetic way of drawing people in and making them feel open and comfortable in her presence, and for that she captured soulfulness in her subjects. These images were and are a huge part of Suki’s body of work, however have not been exhibited until now. She loved and was so proud of all these experiences. Suki Hill’s archival and personal exhibit, “A Photographer’s Intimate View of Mill Valley, California 1900- 2001” was on display in the city’s library for nearly ten years. In 2007 Hill was pleased to receive a Milley award, which honors local citizens who have contributed substantially to the character and fabric of Mill Valley. She was the author of” Mill Valley Then and Now”, in which she paired historic photographic scenes of Mill Valley with her contemporary photographs shot from the same vantage point. Her exhibit, Mill Valley at Work, displayed on the outdoor wall of the ThrockmortonTheatre, was inspired by a commission from the Theatre. The intent was to pay tribute to the individuals who work in Mill Valley. Suki Hill graduated from Sarah Lawrence College and did graduate work in Creative Arts at San Francisco State University and Philosophy at University of California Berkeley. She photographed family weddings, portraits, performances & events. She also made herself available to many service organizations and fundraising events.